You may have noticed I’ve been silent about my recent BMW E30 purchase. The fanfare of buying an elderly autobahn cruiser has been met with months devoid of updates. I can tell you it’s not because I’m having the time of my life driving it. It’s because I found something catastrophic within. You can’t deny E30s have that classic BMW panache, but all the character comes at a cost. I’m talking about old car issues: Leaks, squeaks, and general disrepair are par for the course in a machine that’s three decades from new. It’s no secret that the 1989 BMW 325i I bought certainly had its fair share of mechanical and cosmetic ailments. While the list of needed repairs was long, it certainly wasn’t an impossible hurdle to overcome. That is, until I started digging deeper. The bad news began to unfurl the moment I removed the right rear wheel. As I peered into the dimly lit wheel well, my heart sunk like a pair of tied-up cinder blocks chucked into Lake Michigan. What lay within was a backyard mechanic’s biggest fear: rust. A lesson in questionable design: Routing fuel tank vent hoses through the wheel well. I’m not referring to that reddish-brown substance you can simply brush off and be on your way. No, I’m talking the hole-through-the body kind of rust. It was bad, and what I had just seen was only the beginning. The rust nightmare didn’t stop there. I began working my way around the vehicle to determine how deep the rabbit hole went. There was a hole in the rear valence and there was a hole underneath the left rear spring perch. The bottom of the left rear wheel arch was eaten away and the left front wheel well apron had a perforated seam along the firewall. Oh, and there was also a hole in the right rear rocker panel. I was devastated. Not only was this a lot of rust, but much of it was structural. I began pondering what to do with the poor old E30, which was sitting helplessly on jack stands in the garage. The car was in a disassembled state with the transmission sitting off to the side, awaiting mechanical attention. The car wasn’t going to be driving anywhere under its own power. There was no way I was going to waste time putting it back together, now knowing the terminal rust issues within. I was met with one hell of a dilemma. Should I scrap the car, eating thousands of dollars in the process? Or, should I bite the bullet and properly fix the rust? Much of the compromised metal was hidden behind a thick layer of rubberized sealer. The first option could potentially mean months of waiting for the right person to come get the car, or possibly, have a junkyard come haul it away. 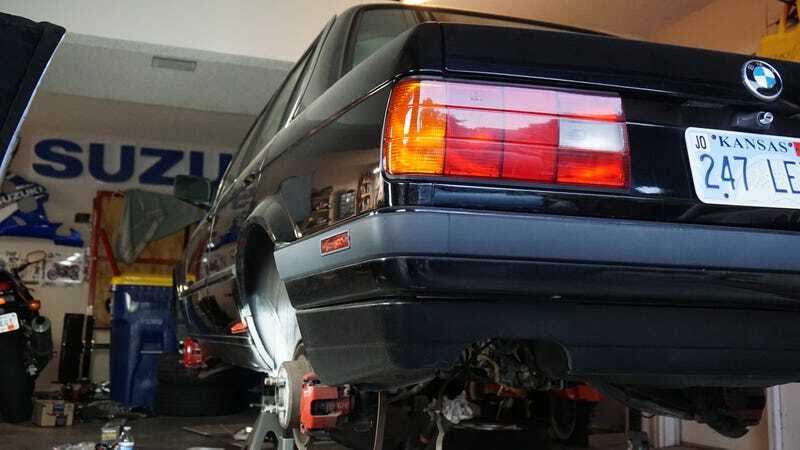 This would be a tricky situation because there was no transmission in the car and the emergency brake cables were cut, meaning there was no way to stop the car once it was off the jack stands. The second option, fixing the rust, meant that I would not only need to learn how to weld sheet metal, but also, I would need to go out and buy a complete MIG welding setup. While there would be no recouping the cost of the welder even if I were to successfully finish the project at hand, the purchase could be potentially justified as an investment to wrangle future rusty lapses of judgement. Nearly three weeks of mental somersaults passed before I came to a decision. In my mind, I had already “lost” on this project. What more did I have to lose by using the car to learn some welding? That thought was the tipping point; I coughed up $950 and found myself the new owner of home garage-grade MIG welding setup. Getting into welding wasn’t an inexpensive venture, but having the ability to properly tie metal together would open up so many previously-closed doors. The new MIG welder, locked and loaded. It took me a while to dial-in the welder so that it would work well with thin-gauge auto body sheet metal. I built confidence with the machine by practicing on some scrap metal. Eventually I reached a point where I was no longer burning holes through the test pieces and I determined I was ready for the real thing. With an angle grinder in one hand and a MIG gun in the other, it was time to get down to fixing this damn car. The first target for my newfound welding “skill” was the perforated seam that joined the left front wheel well apron with the firewall. Upon analyzing the situation, I realized there was no reasonable way to repair this area in a factory-correct way. Drilling out hundreds of spot welds in an attempt to remove every component of the car’s front unibody structure just wasn’t going to happen. So, I drew up the next-best-thing I could think of, which was to create a patch panel to tie the two components together. I traced out a paper template for the patch panel, then transferred it over to a blank sheet of metal. Once the shape was cut out, I had to beat the metal with a hammer so it would fit into all the necessary bends and curves of the wheel well. Following that, I tacked the panel into place with the welder. With the bracing panel installed, I turned my attention to the left front jack pad. The jack pad area is made of four different panels that come together in one spot, and of course, each of these panels was rusted out. I put the angle grinder to the rusted areas to see where exactly the good metal began. Once I found it, I worked from the inner-most panel outward, creating templates from chipboard to fill the voids in the metal. I then traced the templates on sheet metal and cut out the metal to shape. In total, four patch panels were required to completely rebuild the jack pad area. Welding these panels in required getting the welding gun into some tight spaces and welding upside down. Eventually, the patches were one with the car and the jack pad area was fully revived. Next, it was time to deal with the left front floor pan. There was so much rust in the floor pan that it would have been just better to replace it with a new panel. However, replacing with new would be an expensive proposition, so I elected to just patch the existing holes with some fresh metal. As I began grinding away the floor pan’s surface rust, new holes in the floor kept appearing. By the end, I had to make ten or so patch panels to fill them all in. The throttle pedal on these cars is floor hinged, and the pedal hinge consists of a metal bracket welded to the floor. The bracket in this car was being secured to floor by nothing more than the vehicle’s rubberized undercoating. To remove it, I literally ripped the pedal out of the floor by hand. Even still, I was able to salvage the original pedal hinge bracket by cleaning it up with a wire wheel. With the new floor patches now welded in, I lined up the pedal bracket with its original location and then tacked it back into place. Now that the rust issues at the front of the car were under control, I shifted my focus to the left rear corner of the vehicle. There were three main areas of concern here: the bottom of the wheel arch, the spring perch, and some holes in the wheel well which lead into the trunk. Unfortunately, there wasn’t much left of the original wheel arch to use as a template for recreating either of these components. This meant I had to eyeball the reconstruction of the inner and outer wheel arch surfaces and then modify them after the fact so that they looked “right.” The inner support area ended up requiring seven different patch panels and the outer “skin” portion was made up of four separate panels. Once all the panels were welded up, I cut away the excess metal using a mirrored template I made by tracing the right side’s wheel arch curvature. I think the finished product looked decent considering it was my first go at this sort of thing. Most of the remaining cosmetic imperfections will be addressed when it comes time to prep the area for paint, which is still quite a long way down the road. The holes in the wheel well which lead into the trunk were the next point of focus. I ground away the rubberized undercoating around the work area which revealed much larger holes than expected. I made up some patch panels and stitched them into the car’s body. The end result certainly isn’t pretty, but heck, the holes are now gone. The last area to be addressed was the sizable hole that had developed near the left rear spring perch. To access this area, I disconnected the shock absorber from the left trailing arm and pulled the spring out from the car. From there, I cut away the compromised metal with the Dremel tool until I reached a solid, weldable surface. This significantly increased the size of the hole, which if anything, made it easier to create a patch panel for it. Welding the new patch panel into place was a breeze compared to any of the others because the surrounding metal was much thicker. This allowed me to put down a much hotter, prolonged weld bead to tie the patch into the body of the car. With the spring perch repaired, I stepped back from the car to review my work. I was only one-third of the way through the needed rust repairs. Damn! It may sound like I did this all in a Saturday afternoon. Well, the truth is, the above repairs took the better part of two full weekends. To add to it all, there will be many more weekends required to completely finish the rest of the rust repairs. Starting out in auto body welding can be a long, arduous process met with a steep learning curve. However, after putting in the time, I can tell you I’ve become much better at analyzing how rusty body panels can be reconstructed. I’ve also become far better with the MIG welder than I ever thought possible. I have a long way to go before my welds could be considered anything close to “good,” but ultimately, it’s about learning from the screw-ups I make along the way. As long as I have the drive to keep pushing on, I’ll reach the end eventually. This BMW project quickly turned into a regrettable disaster when I stumbled upon the inescapable grasp of rust. Deciding to use the car as a canvass to hone a new skill has led to countless triumphs and pitfalls, but somehow, I think I’m coming full-circle on this thing. I might just be able to save this ol’ BMW after all.